Modify the various options Gender, Age, Etc. to find the body that contains the Skin you want to be downtown Buyable. 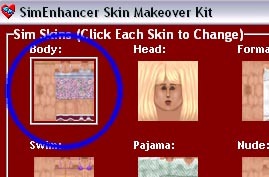 Then Select the body that contains the skin. Usually these will be a normal Body but others will work. For this walkthrough we are going to select Body. See the white box around it? This indicates this is the current skin we are working with.